Plot bunnies. Those story ideas, scene fragments, characters, or images from a yet-to-be-written story that nag nag nag to have their story written RIGHT NOW and won’t leave us alone to focus on the story in progress. They look cute and fluffy and friendly, but oh boy, they can also be trouble! He only had twelve? Lucky guy! My brain teems with story ideas. And they really do multiply. My new story ideas never come one at a time, they come as entire series. And far too often, they distract me from the story I should be writing. I suspect that’s a sneaky procrastination method. “But I am writing.” Hmm, nice try, Ms. Procrastinator! Or could be, it simply happens because my brain is set to creative mode. They do attack more when I want to be writing something else. But whatever it is, it’s about as welcome as a family of hungry rabbits moving into my veggie patch! I should be finishing up my stories for the wonderful A Tuscan legacy multi-author series. I’m already a little behind where I hoped to be by now with my books, set in Wales and Tuscany. I love the series. I love the stories. I love my characters, especially Rachel and Jonathan, who you’ll meet in book 1, Marion’s That’s Amore, the one you heard about on Thursday. They’ll reappear for their own story in Book 8, Dolce Vita (Sweet Life), and appear again along with all the cousins in book 9, La Risposta (The Answer). An entire opening scene for a story, which appeared while making breakfast one day and emerged on my computer screen way faster than I thought I could write since my pesky illness started. It’s looking like it will be this year’s Huckleberry Lake Christmas story. The one I found a cover image for a few weeks back, but had no idea who those characters were. Uh, that would be when I was looking for cover images for a whole different story – chasing other plot bunnies you’ll hear about next year! New ideas for a multi-generational family saga (more women’s fiction than romance) set in my birth country, Australia, requiring massive research and fact-checking. That series first appeared in 2013 with an entire month of nothing but solid 8-hours-a-day research for the first book, followed by a 70,000 word incomplete draft set on an 1830s convict ship bound for Sydney. They hadn’t arrived yet, and I hadn’t even mentioned something that will become a major theme for the series, so each book will probably need to be at least 120,000 words! Eep! Another Aussie series, involving the staff at a Royal Flying Doctor base. Despite the fact I worked at one for a while in the ’90s, it will still require loads of research. And then there’s that odd quirk of mine – I can’t write romance about any job I’ve actually done. Experiencing the reality is such an imagination killer! That means if it ever gets written, this series is likely to be more women’s fiction than romance. Nope. Not happening. I love romance too much! Ideas for not one but THREE linked stories for my Princess series that keeps getting postponed. I started Book 1 last year, but had to set it aside half-way through. The want-to-writes are stacking up fast, and the original trilogy has now grown to three linked trilogies – nine books! By the time I begin releasing the series, most likely 2020, I can’t help wondering how many more there will be. At least the books in this series are all romances! Phew! Ideas for six more books in my Sweetapple Falls series, on top of the five I already have. At least my latest solo ebook release, His Father’s Son (previously published in the Cherish boxed set last year) won’t be orphaned and on its own too long. A romance series involving a family and their friends I was going to set in a different small-town location have decided they want to move to Sweetapple Falls, Oregon. That one is truly awesome news, as I welcome the chance to write more about Josh, Anna, Luke, and the other characters! That’s pretty much a typical week of idea sparking for me. But, I should be writing! The book that needs to be done first, not the new idea! So I write down the story idea as fast as I can. Tell it to join the queue. File it away. And then forget it. It will have its time, but that time isn’t now. And I get back to work on the stories whose time is now! God has a lesson for me in this, and it’s far more than trusting I will never run out of story ideas! Through this, and through the pesky illness that hit me two years ago, He’s teaching me to hope for the future, but to live in the present, trusting that He will take care of whatever happens next. Because he does, and He will! Each comment on this post will go in the draw for the winner’s choice of my ebooks, as well as in the Big Birthday Bash prize draw! Winner for my ebook giveaway will be chosen randomly from all comments made on this post by March 2nd. And that cover reveal? Visit the A Tuscan Legacy website (after you comment here!) to see the gorgeous cover Marion made for Dolce Vita! Hi Autumn, plot bunnies sound frustratingly exciting!! The stories set in Australia sound intriguing… but at the moment I am eagerly anticipating the Tuscan Legacy series- they sound great and I cannot wait until they start releasing. Hi Wendy! Yes, I’m hoping I get to write the Aussie saga, too. Very different to what I usually write, but so fascinating too. The research needed and the time they would take is the thing – I would guess a year of full-time work for each book! I’m thankful that God is showing me that rather than wasting time now regretting past mistakes, surrendering my past and my future and each one of my present moments to him is the way to live. I’m dar from perfect, but it’s making a big difference. 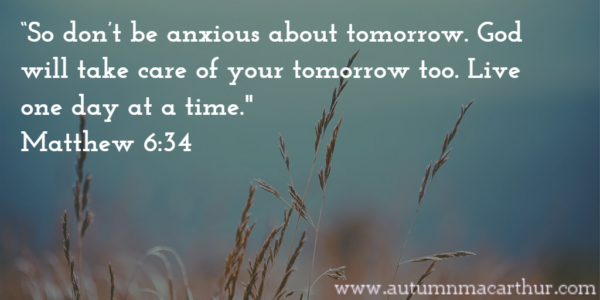 “Do not be anxious about tomorrow “. That’s what I kept telling myself at 2:00 in the morning last night. I was worrying about a family member who has dug a financial hole for herself. But worrying doesn’t help a bit. Autumn, I’m glad you have story ideas to spare. I pray we both learn to trust more. Hugs, Sherri! Praying for you and the family member. Learning to trust is a process, so be gentle with yourself. God asks us to forgive ourselves for our mistakes, as much as He asks us to forgive others. 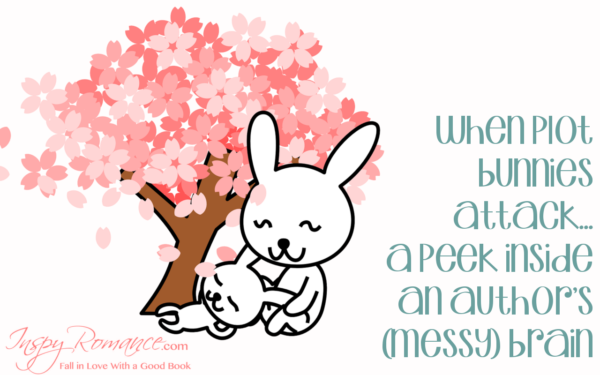 Thoroughly enjoyable post and your words “plot bunnies” brings a big smile to my face! I enjoy seeing the creative gifts that are given to some people! I loved that God has given you: “hope for the future, but to live in the present, trusting that He will take care of whatever happens next.” Wonderful & immensely interesting post! Thank you, Becky! I believe God made us in His image, so as He is the ultimate Creator, He gave each of us a creative spark, too. There are so many ways to create! Hi Autumn! Insightful post. “Plot Bunnies.” You are bringing a chuckle to your readers. Delightful John Steinbeck quote. With his ranch hand experience, he definitely understood rabbits. Even though I am not a writer, I so identify. As a retired American literature, when I did research while prepping for my classes; I often was side tracked. More fun preparing for classes than grading papers. Never been to Italy, therefore especially looking forward to A Tuscan Legacy series. Happy Writing. Best wishes. Hi Renate! I haven’t been to Italy either! I’m so grateful to Marion for her hands on research and wonderful photos, and of course the internet lets us visit anywhere on earth! I agree on preparing for classes being far more fun than grading papers. I spent a year as a college nursing lecturer, and I had great fun researching and digging deep to get a good understanding of a topic before presenting it to the class. But grading- ack! Especially the times huge piles of grading were unexpectedly dumped on my desk and needed doing by the next day because someone went off sick! More than a few all-nighters because of that. One thing about plot bunnies, they multiply like, um, rabbits. I have a lot of stories stewing at the back of my imagination, too. I’m sure I don’t need another unique idea for the rest of my life, because I can’t write fast enough for the ones I already have! Like you, I took a morning last week for the first chapter of this year’s Christmas story. It’s pushing hard these days, but I have a prior deadline… or two. And I have ideas for two historical series set in Canada, but gah! Research! Plus, not contemporary. I think the histories of our home countries, no matter where we grew up, are so rich in potential story ideas. And fascinating research. But yep, I can’t write fast enough for all the contemporary Christian romance ideas I have. Don’t want to complicate things by giving those romantic suspense, historical, and women’s fiction bunnies too much space to multiply! I’m hoping our idea sparks are a sign God intends to bless us with long fruitful lives, because otherwise why did He give us so many ideas? LOL, it’s a nice theory. But just in case He doesn’t, and as even if I’m blessed with a VERY long life I’ve certainly used up half my time here already, I’m making time to write today and every day, too! I enjoyed reading your post. Happy writing! Thank you, Margaret! Happy reading, and whatever else you love to do. That’s super interesting! My version of plot bunnies is idea squirrels that love to party (or rave) right when I want to sleep – my notebook is my best friend at that point – I scrawl each one down, then a few more pop into place! LOL, Emily! Yes, a bedside notebook is an essential! And those ideas really know how to party – especially when we want to sleep. “plot bunnies”…those words gave me a laugh. I get them and I’m not an author. Thankfully, you are! You know how to write them down, then make a sensible story come to life from them. I cannot. I’m curious, when you read a romance that involves a job you’ve worked in, do you see it as a romance or does the reality of it take over? I think we all get our forms of plot bunnies, Andrea! There’s no magic or special talent making a plot bunny into a story, it’s just lots of practice. It took me many years and a lot of stories started but given up on before I stuck with one through to The End. LOL, and then a lot more years to learn how to make those messy drafts into slightly less messy stories. For me, it’s all in the edits. I only ever really find out what the story is when I’m about half-way through. But it IS hard for authors to get it right all the time. I do loads of research on locations and jobs and all sorts of weird and wonderful stuff for my stories. Despite that, I’m sure I still often get things wrong. Hello, Autumn! I loved reading your post and all your story ideas. I can imagine your dilemma. They all sound so interesting! I live in the world of procrastination where lots of story ideas abound. Linda, make sure you write those ideas down! You have the first qualification to be a writer – you read a lot, and you LOVE stories. And the second qualification – you know how to use words. Qualification three is persistence and lots of practice, and that was my sticking point for way too many years. Then I hit 49, and made a new year’s resolution that it was time to see where all those half-baked ideas of mine led, and to stick with a story to the end, no matter how bad it was. I did a JanNo (like a NaNoWriMo, but in January), pulling one of my quickly scribbled ideas out of the file. I finished a draft. It was baaaaaaad! Five years and a load of finished-but-will-never-be-published stories later, I finally figured it out. Kind of! As a reader, I really enjoyed your post! Looking forward to reading your stories! If you haven’t read anything of mine yet, I have thirteen current releases, including one that’s always free. You can see them in the books page here, or visit my website. Chasing plot bunnies sounds exhausting and exciting all at once! LOL, yes, it’s definitely fun, Melynda! Wow! It’s so interesting how different God has made each of us. My brain is definitely not wired that way and I can’t imagine what it would be like to have all of those plot bunnies attacking. How God has made us all so different is one of the wonderful things about Him, I think. You will have other talents that plot bunny chasers don’t! Very interesting post,we love to read some of your books some time. I’m from Canada. If you’d like to see the books I have currently available (including one that’s always free), visit the books page here, or my website. Love the plethora of ideas! How come I never have plot bunnies hopping around?!?! Oh, right….that’s because I’m not an author! Ha ha! But as an avid reader, I really do appreciate your multitude of ideas, especially when they become books. LOL, I’m pretty sure readers get them too. When you read a book and start mentally rewriting the scenes you feel could have been better. Um, hopefully not my books, of course! It does sound like you won’t run out of story ideas for a long time to come though. I popped over to see the cover of Dolce Vita, what a beauty! Marion did amazing work for all our covers – I LOVE what she did. LOL, and yes, I do sleep, though rarely at normal times! I tend to write at night once my husband is asleep and the house is quiet, then sleep late. And yes, I do get woken with ideas I have to write down straight away. Characters seem to grow lives of their own, and though sometimes they take over and move the story in a different direction to the one I expected, it’s not quite at the stage where they take over my life. That does sound like it would be very challenging to stay on course with a current writing, while maybe jotting down a few ideas for future projects. I don’t know how you authors do what you do, but sure enjoying the final result. I’m glad you’re enjoying the results, Andrea. And us authors love what we do. Well, apart from the times we’re stuck with a story and wonder if God’s telling us to stop writing! I suspect we all have those moments, though thankfully not too often! Me too, Narelle! It’s been a big project, but I’m sure it will be worth it! LOL, me too! My dear husband can’t understand how I could be quite happy by myself for hours with my imaginary friends! I love the term “plot bunnies”! It’s great that you have a system for keeping those bunnies from hopping away so you can fully develop them at a later time. LOL, yes, I think every writer needs to find a system that works for them to keep the bunnies, but stop them getting out of control! Now I just want to read all of these stories. Please keep them coming. Hi Priscila. :) I want to write them, too! I’m writing as fast as I can! Which is slower than I’d like, but hopefully all these stories’ time will come. Thanks so much for your post! I loved hearing about plot bunnies! I can’t wait to hear more about the ones you chased! Thanks, Jenny! Some of them you’ll hear about this year, some next year, and the rest are in God’s hands. I’m hoping their time will come, because I’d love to write ALL these books. And LOL, guess what happened? I went to make a quick note of that on the file for that idea, and came up with a completely new though kind of linked one set in Sydney. Chasing one plot bunny gave me another one! Wow! Those plot bunnies have brought you some incredible ideas for novels. They all sound interesting. I love royal stories, so I hope you are able to get to those at some point! I hope so, too, Brittany! Unfortunately it may be 2020 before I can write those, but I’m really looking forward to it! Too many bunnies, not enough hours in the day! LOL I’m not a writer but I see similarities in our brains. Hi Natalya! I’m sure not only writers have this- people need to think creatively in so many different areas. It can be a tremendous asset. Except when it’s a big distraction from actually doing the work!